There’s nothing more frustrating than buying a bundle of fresh, leafy greens from the grocery store, only to have them go bad just days later. It can be difficult to keep produce from wilting, but if you change a few things you do in the kitchen, it isn’t impossible. 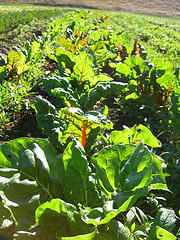 Here are four smart tips to help you extend the lifespan of your leafy green vegetables. Pull off any bad leaves. The old expression that one bad apple can ruin the whole basket is certainly true in this case. Even one dead, wilting leaf can cause a chain reaction throughout your head of lettuce or bundle of kale, so be sure to remove any bad leaves as soon as you get home from the store. Do not chop. Try to keep greens in their whole condition whenever possible. This will ensure that they stay fresher and greener until you’re ready to use them. Dry them properly. After washing your greens in the sink or in a salad spinner, they can go bad very quickly if you don’t thoroughly dry them. Gently roll the whole bunch into a clean tea towel to squeeze out the excess water before placing them in the refrigerator. Start at the beginning. If all else fails and your greens still go bad well before their time, you may want to think about where you’re shopping. Opt for a grocery store with a well-maintained produce section to ensure a longer lifespan for your veggies.